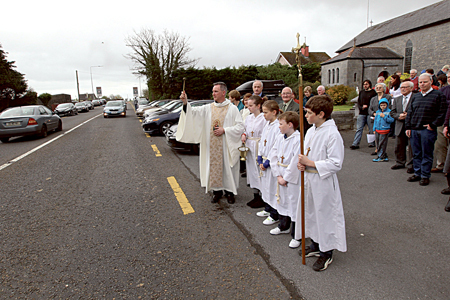 Fr John Kenny blessing the road outside Partry Church last Easter. Clerics in Co Mayo will bless the county’s roads in a novel ceremony aimed at reducing the number of people who die in traffic accidents each year over the Easter weekend. The campaign comes after the Garda expressed serious concern over a rise in road deaths in the west over the past two years which runs contrary to the downward trend nationally. Single vehicle crashes involving male drivers in random locations constituted the largest number of fatalities in the region last year, while overall deaths in the region had risen from a low in 2010. Speeding in 80km/h and 100km/h zones had been identified as a major factor in fatalities in the west. A special blessing of the roads ceremony will take place in many parishes throughout the county on Easter Sunday as religious leaders back the campaign to make the roads safer. The ceremony, which will take place at most Catholic churches, comes with a plea for people to use roads safely and will also be made at Church of Ireland churches on Sunday next. This campaign is being promoted by the road safety office of Mayo County Council. Noel Gibbons, road safety officer, said: “The community makes improved road safety a goal in an effort to ensure that the grief associated with loss of life, or serious injury, does not come to them. Martin Cashen, regional traffic inspector, added: “An Garda Siochana appeal to all road users to think ‘Safety’ every time they use the public roads and streets. Tuam archdiocese spokesperson Fr Fintan Monaghan said the church was “fully behind the campaign. We all need to play our part to reduce the number of road deaths.